I had the chance to capture three very different experiences on my first trip to Mexico in July 2017, all with their own photographic challenges. 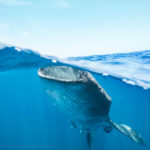 When filming whale sharks in the “Afuera” – their aggregation site off Isla Mujeres – I had some of the clearest, bluest and sunniest water I have ever seen in whale sharky places. More commonly, the water is green and full of plankton of all shapes and sizes, but in the Afuera whale sharks feed on fish eggs which are carried by the current into this blue water area offshore. This meant, that shots of whale sharks feeding at the surface were easy to get. Whale sharks also sometimes hung vertically in the water while gulping in mouthfuls of fish eggs. They would remain stationary, so I had time to position myself in the right spot and film the show. The major challenge in the Afuera were the numbers of boats and tourists. Usually, I prefer filming wildlife with only their habitat in the frame, so I just had to wait for right moment. As I lead science & photography trips with Rafael de la Parra and Aqua-Firma we stayed out longer and often hung around at the edge of the aggregation, or found sharks away from the main area where we had a more relaxed time with the sharks. I filmed at 60fps HD and 1/125s shutter speed most of the time to have the chance to slow things down a bit afterwards, but then ended up using footage in real time, so next time I’ll probably shoot 30fps 4k. Over-under of a whale shark feeding at the surface (7-14mm @7mm, 1/250, f4, iso200, natural light). The famous cenotes, or caves, of the Yucatán Peninsula offered a very different underwater experience to the whale sharks. The major challenges here were the light in those dark caves and the droplets on the dome when trying to get over-under shots in air-filled parts of the caves. The clarity of the water meant that my two relatively small video lights illuminated much more of the scene than they do when shooting on a reef. I also had a torch, but never used it for filming. The three shots I was mainly going for was to follow a diver through the cave, capture the stalactites and stalagmites, and show how the cave extends above and below the water surface. I filmed at 4k 30fps as I did not plan to slow anything down. I only did two dives, but was happy to have another chance for over-under video on a snorkelling tour of another cenote a few days later. That time, I smudged a cut potato on the dome port before going in, and that kept the droplets nicely away from the air exposed portion of the port. Two divers enter a cenote in Mexico (7-14mm @7mm, 1/125s, f4, iso800, natural light). My friends Barna and Elizabeth from Encounters knew place where we had a chance of seeing two young wild jaguars. They would emerge from the jungle in the early night near a hut where they used to be able to find left-over food. So even though they were wild, these jaguars had gotten somewhat used to being around lights and that’s what made filming them possible. My camera is not particularly good in low light conditions (see my gear post), but with the help of a torch I managed to get some footage. Focusing was probably the trickiest as the autofocus struggled in the low light. The jaguars were careful but came pretty close to us, and I also had time to put the camera down and just enjoy the encounter for a while. A wild jaguar emerges from the jungle (100-300mm @177mm, 1/125, f4.7, iso1600, torch light from the side). I really like jellyfish! They move gracefully, there are lots of them and they are an excellent subject for pretty photos since they don’t swim away when you get close. Sure, I have been stung in the water before, but mostly by siphonophores like blue bottles (technically not jellyfish) and always because I was chasing after whale sharks rather than looking where I was swimming to. So the bottom line: jellyfish are awesome! Jellyfish make a great subject to practise your photography (7-14mm @7mm, 1/250s, f18, iso200). I had the chance recently to take some cool photos of jellyfish in Tanzania. I had plenty of time to shoot and improve because the jellies would swim around the mangroves in front of my hut every day at high tide. My main goals were to get an over-under photo that shows the jellies in their mangrove habitat, and to capture a nice “jellyfish in the sun” photo. The main challenge with the over-under shot was to get the top side in focus as well. I tried with a high f-stop but there is still room for improvement. Between two worlds (7-14mm @7mm, 1/60s, f14, iso1250). For the silhouette photo of the jellyfish with the sun in the background, it was more about the shutter speed. David Robinson gave me some excellent tips to bump up the shutter speed as much as possible after I showed him my first attempt. It worked really well and the sun rays came through nicely. Other than the camera settings, you just have to hold your breath for a long time, hold on to a mangrove root at the bottom and wait for the jelly to swim over your head in front of the sun. A jellyfish swims in front of the sun (7-14mm @7mm, 1/1250s, f5.6, iso200). 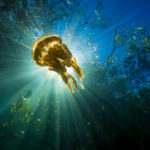 EventualIy, I got that shot of a jellyfish in front of the sun among the mangroves – one of my all time favourite photos. A jellyfish swims through the mangroves (7-14mm @7mm, 1/3200s, f4.5, iso 640). For video, things are a bit trickier since you cannot simply pick the best of many frames. Stills are also much easier to edit. But video is awesome and jellyfish are a good subject since you can try until you get the shots you wanted. I shot the clip below in the 4k Cine-D profile with the occasional HD 96fps slow motion. I had the camera in aperture priority and it turned out ok, but these days I would shoot at 60fps and prioritise the shutter speed at 1/120 to get nice smooth motion. If you don’t know what I am talking about, check out this quick explanation. With the camera ready, all I did was wait for high tide on a sunny, calm day to minimise water turbidity and then get the shots. While watching the northern lights in Norway and Sweden in 2016 & 2017 (see my travel post), I managed to take some nice photos of the spectacle. Of course there is room for improvement, so let me share the insights from my first go at it. Lady aurora putting on a show over a lake in Sweden (7-14mm @7mm, 30s, f4, iso 1600). Starting with the gear. I have a micro 4/3 camera that I got mostly to take video and photos underwater. It is not the ideal set-up for astrophotography. Compared to the GH4 (see my gear post), other cameras with a larger sensor and higher light sensitivity would be better, but then again there is always a better set of equipment out there. Time-lapse of the northern lights taken in Andenes. For the lenses, it is all about speed and field of view. On my first trip north, I had my 7-14mm wide-angle lens (great for photos of sharks) which covers a relatively large portion of the sky, but is slow at f4. Then I also have a 25mm with a limited field of view but a fast f1.4 aperture. 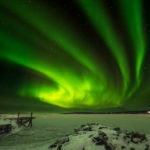 When the aurora was strong, the f4 lens worked ok and for time-lapses the faster lens allowed taking a shot every 3 seconds to get a smooth transition between frames. The time-lapse above was shot mainly with the 25mm lens. You can see the section shot at 7mm where the frames “jump” more because of slower shutter speeds and associated processing time between shots. The northern lights above a snowy field (8mm, 30s, f2, iso 1000). On my second trip, I borrowed Simon‘s 8mm fisheye lense with a fast aperture, and it made a huge difference. The wider aperture brings in more light, so you can have a faster shutter and more defined auroras, and the wider angle allows you to capture more of the sky. If I end up doing more night photography, I’d definitely get that fisheye lens. The northern lights dance above Andene’s lighthouse (8mm, 2s, f2, iso 1000). Apart from that you need a tripod and use the 2 second timed-release function so you don’t blur the photo when pressing down the shutter button. Carry a spare battery with you as well, as they run out faster at -30°C. The last thing concerns the infinity focus. In a dark night and without a light-up object close by you will have to manually focus. I realised that simply focussing all the way to infinity doesn’t produce sharp photos after an amazing aurora show…so don’t make the same mistake and learn first where the infinity focus of your camera and lens actually is. This could have been a pretty photo, if I had manually focused correctly… (7-14mm @7mm, 10s, f4, iso 800). When the northern lights are dancing fast, a 2 sec exposure at f2 should about do, otherwise you start losing the structural detail and the beautiful lights become a big green smudge on your photo. So in dark nights, a more relaxed aurora can be better because you can leave the shutter open for 20 or 30 sec and also get a bit of light on the mountains and some stars in the sky. Generally, you’d want to avoid overexposing the aurora because pulling down the highlights during processing can only do so much, while there is more wiggle room with brightening the dark areas. Finally, in post you could of course play with the colours, and the colours of the aurora do vary depending on the strength. I tend to not adjust the colours, and my aurora experiences were often quite green, but we also had some lovely turquoise and purple. Another great aurora dance on a cloudy night (8mm, 2s, f1.8, iso 1000). The northern lights produced (almost) a heart shape. Full disclosure: I dropped the exposure by -1.6 around the top of the light in post …(7-14mm @ 7mm, 13s, f4, iso1000). The northern lights have been off my radar for most of my life. Although I knew they existed, spotting them was not high on my list, mainly because I like being in the tropics and the aurora only shows up where it is really cold. But then I had the chance to go to Norway and Sweden in winter 2016 and 2017 and chasing the northern lights quickly became a priority – after all there is not much else to do outside in the polar night when the sun doesn’t rise at all. After my first glimpse, I was hooked instantly. This is as bright as it gets in the polar night… The sun did not make it above the horizon during our visit. 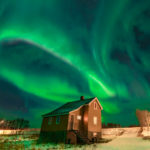 There are many websites dedicated to helping you find the best location for seeing the northern lights, but in brief, you will want to be north of the arctic circle in a dark place with no clouds. For timing, winter nights from September to March are generally good and then you just have to be lucky to be there when the show is on. With Tromsø, Andenes and Abisko, we visited three top spots for aurora watching and had an amazing time. Are you heading north yourself? Then check my photo post for tips on how to capture the northern lights. The northern lights put on a spectacle over a fjord in Norway. Tromsø also happens to be a good town for whale watching, so we hopped on one of the many boats on the first morning in search of free willy and friends. After about 90 min cruising through the fjords, we saw the first blows in the distance. Shortly afterwards two humpback whales were cruising next to our boat, apparently undisturbed on their morning swim looking for herring. We followed them for a bit until a pod of orcas approached us. They too were looking for herring and it was great to see one after the other emerge for a breath as they travelled past us. Especially the large males with their huge dorsal fin are impressive. Time with the whales was up way too quickly, but it is a good call from the operators to give the whales their space too. The second time we went on a speed boat trip hoping to get closer to the orcas. We saw them again, but the weather was not great and we were happy to have the survival suits on for the way home. Orcas hunting herring in a fjord near Tromsø. Tromsø itself is quite large with many lights, so you have to get away from the city for the best northern lights viewing. We rented a cabin in Lakselvbukt, about 1h drive from Tromsø and reachable with buses if you time it well. The second winter, we stayed somewhere near Andenes, again out in the bush away from the lights. The idea of waiting in a warm cosy cabin for lady aurora to show up seemed like a good option for someone who might not survive more than 2h outside in the polar night. Our cabin in the woods overlooking the fjord. It does not get much better than this. The strategy was simple: go for a hike while there is a little bit of light (10am-2pm) and then start the fire place, play some board games, read and have one eye on the aurora forecast and one eye on the sky through the window. Sometimes the 30 min forecast was spot on, giving us just enough time to put on all the gazillion layers of clothes and be outside ready for the show. Other times, it predicted a kp1 (low chance) while we had the lights dancing over our heads. The cabin was so good because you could see the aurora from the window and get back to the warmth when she had moved on. The fjord setting was nice for catching the aurora reflection on the ice and the high mountains provided a good background for time-lapse photos. The northern lights dancing above the fjord and reflecting on the ice. Abisko in Sweden has a different setting, with more lights around the hostel, but a short walk away it is dark and there are no high mountains constricting the view of the sky. Favourite spots for viewing the northern lights include the lake shore and the heli pad. In addition, there is much more to do in Abisko than in a lonely fjord cabin. We packed in some awesome snow shoe hikes, cross-country skiing excursions and walks in the national park. Abisko was also much colder than the relatively warm fjord, with temperatures around -25°C. That is very cold. My camera even froze at one point. Awesome skiing in Abisko while there is some light. We went to Andenes mainly because there was a chance to snorkel with orcas, but during our week there the sea was too rough and we could not give it a go. Thankfully, it turned out that Andenes is also really good for northern lights. We stayed in the village for a few nights and had epic aurora dances over the lighthouse. Afterwards, we stayed in a cabin near Dverberg and had more northern light shows. We also spotted some moose thanks to our friendly AirBnB hosts. The lights dancing over our cabin in Dverberg. We saw the northern lights pretty much every night while up above the arctic circle, with the first night in Tromsø city and a couple of cloudy nights in Abisko and Andenes being the only misses. Sometimes it was a narrow green band emerging from behind the mountains and other times the whole sky was light up and it felt like I could touch the dancing lights. If you enjoy natural spectacles, then make it your mission to head to the far north next winter! We flew into Tromsø, Norway, and out of Luleå, Sweden. I had some amazing wildlife encounters before I got a proper camera, but still managed to collect some reasonably nice photos then. A chameleon crossing the road in Madagascar, shot on my phone. I now have a Panasonic GH4 camera that I got in early 2015. The strongest reasons for me were that the camera internally records 4k video and that it is still small enough to travel. Hikers crossing a snowy pass in Landmannalaugar, Iceland. A light camera body is nice for hiking when you carry lots of other equipment already. Micro 4/3 cameras benefit from a large selection of lenses, including Olympus, Panasonic and others such as SLRMagic or Voigtlander. I started with the Panasonic 14-140mm lens – double those numbers to get the full-frame equivalent. This lens spans a wide focal range and consequently does not have the most amazing qualities, but it is a good one for hiking when you might try to capture a photo of an arctic fox in the distance and then take a panorama photo of your tent next to the fjord. Apart from hiking trips, I don’t use this lens anymore. My primary underwater lens is the Panasonic 7-14mm wide-angle lens. The wide angle is perfect for whale sharks and other large marine animals. I chose this one over a fisheye lens largely because I think video with a fisheye does not look as good as with a rectilinear lens. I also have the Olympus 60mm macro lens for smaller reef creatures, and the Panasonic 25mm f1.4, a nice lens for low light situations, portraits and interviews and getting good time-lapses of the northern lights. My latest addition to the lens family is the Panasonic 100-300mm zoom lens to get closer to wildlife on land. The 7-14mm wide-angle lens also gives the opportunity of some close-ups (for really large fish at least). I take the GH4 and wide-angle lens underwater in a Nauticam housing and I have a couple of video lights (iTorch Venom38), too. The housing is fantastic and even though I ruined the dome by putting ethanol on it, I could rescue it (with some help – thanks Clare) thanks to its acrylic nature. Phew! The vacuum seal is also really useful to check for leaks and the feeling that your precious camera is safe inside the housing. 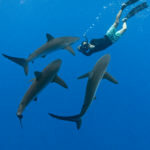 Shooting silky sharks underwater with my Nauticam housing. Photo by Jonathan Green. Filming a really big fish in the Galapagos. Photo by Simon Pierce. Scientific publishing is therefore easy to understand for social media savvy kids because it is similar to experiences that don’t count unless the picture of it is on facebook. For scientists, however, it actually makes a lot of sense to publish findings. After all, sharing your new knowledge spurs further discoveries by colleagues around the world. You can read all papers that I wrote or contributed to here, and for any questions feel free to drop me a line. Collecting zooplankton during my PhD field work in Mozambique. Chris Rohner, Anthony Richardson, Fabrice Jaine, Mike Bennett, Scarla Weeks, Geremy Cliff, David Robinson, Katie Reeve-Arnold and Simon Pierce (2018) Satellite tagging highlights the importance of productive Mozambican coastal waters to the ecology and conservation of whale sharks, PeerJ. Chris Rohner, Katherine Burgess, Joshua Rambahiniarison, Joshua Stewart, Alessandro Ponzo, Anthony Richardson (2017) Mobulid rays feed on euphausiids in the Bohol Sea, Royal Society Open Science. Chris Rohner, Amelia Armstrong, Simon Pierce, Clare Prebble, Fernando Cagua, Jesse Cochran, Michael Berumen & Anthony Richardson (2015) Whale sharks target dense prey patches of sergestid shrimp off Tanzania, Journal of Plankton Research doi: 10.1093/plankt/fbv010. Chris Rohner, Anthony Richardson, Clare Prebble, Andrea Marshall, Mike Bennett, Scarla Weeks, Geremy Cliff, Sabine Wintner & Simon Pierce (2015) Laser photogrammetry improves size and demographic estimates for whale sharks, Peer J doi: 10.7717/peerj.886. Chris Rohner, Lydie Couturier, Anthony Richardson, Simon Pierce, Clare Prebble, Mark Gibbons & Peter Nichols (2013) Diet of whale sharks Rhincodon typus inferred from stomach content and signature fatty acid analyses, Marine Ecology Progress Series, 493: 219-235. Chris Rohner, Simon Pierce, Andrea Marshall, Scarla Weeks, Mike Bennett & Anthony Richardson (2013) Trends in sightings and environmental influences on a coastal aggregation of manta rays and whale sharks, Marine Ecology Progress Series, 482: 153–168. Chris Rohner & Thomas Cribb (2013) Opecoelidae (Digenea) in northern Great Barrier Reef goatfishes (Perciformes Mullidae), Systematic Parasitology, 84:237–253. Chris Rohner, Anthony Richardson, Andrea Marshall, Scarla Weeks & Simon Pierce (2011) How large is the world’s largest fish Measuring whale sharks Rhincodon typus with laser photogrammetry, Journal of Fish Biology, 78: 378–385. Cindy Bessey, Simon Jarman, Michael Stat, Chris Rohner, Michael Bunce, Adam Koziol, Matthew Power, Joshua Rambahiniarison, Alessandro Ponzo, Anthony Richardson & Oliver Berry (2019) DNA metabarcoding assays reveal a diverse prey assemblage for Mobula rays in the Bohol Sea, Philippines, Ecology and Evolution. Clare Prebble, Chris Rohner, Simon Pierce, David Robinson, Mohammed Jaidah, Steffen Bach & Clive Trueman (2018) Limited latitudinal range of juvenile whale sharks in the Western Indian Ocean suggests the existence of regional management units, Marine Ecology Progress Series. Joshua Rambahiniarison, Mary-Jane Lamoste, Chris Rohner, Ryan Murray, Sally Snow, Gonzo Araujo & Alessandro Ponzo (2018) Life history, growth, and reproductive biology of four mobulid species in the Bohol Sea, Philippines, Frontiers in Marine Science. Gonzo Araujo, Chris Rohner, Jessica Labaja, Segundo Conales, Sally Snow, Jessica Labaja, Ryan Murray, Simon Pierce and Alessandro Ponzo (2018) Satellite tracking of juvenile whale sharks in the Sulu and Bohol Seas, Philippines, PeerJ. Stella Diamant, Chris Rohner, Jeremy Kiszka, Tanguy Guillemin-d’Echon, Arthur Guillemin-d’Echon, Elina Sourisseau and Simon Pierce (2018) Horizontal movements and habitat use of satellite-tagged whale sharks (Rhincodon typus) off western Madagascar, Endangered Species Research. Brad Norman, [many others], Simon Pierce, Clare Prebble, Chris Rohner, [many others] (2017) Undersea constellations: the global biology of an endangered marine megavertebrate further informed through citizen science, BioScience. Joshua Stewart, Chris Rohner, Gonzalo Araujo, Jose Avila, Daniel Fernando, Kerstin Forsberg, Alessandro Ponzo, Joshua Rambahiniarison, Carolyn Kurle & Brice Semmens (2017) Trophic overlap in mobulid rays: insights from stable isotope analysis, Marine Ecology Progress Series. David Robinson, Mohammed Jaidah, Steffen Bach, Chris Rohner, Rima Jabado, Rupert Ormond & Simon Pierce (2017) Some like it hot: Repeat migration and residency of whale sharks within an extreme natural environment, PLoS ONE. David Robinson, Rima Jabado, Chris Rohner, Simon Pierce, Kevin Hyland & Warren Baverstock (2017) Satellite tagging of rehabilitated green sea turtles Chelonia mydas from the United Arab Emirates, including the longest tracked journey for the species, PLoS ONE. Jess Williams, Simon Pierce, Chris Rohner, Mariana Fuentes & Mark Hamann (2017) Spatial distribution and residency of green and loggerhead sea turtles using coastal reef habitats in southern Mozambique, Frontiers in Marine Science. David Robinson, Mohammed Jaidah, Steffen Bach, Katie Lee, Rima Jabado, Chris Rohner, Abi March, Simone Caprodossi, Aaron Henderson, James Mair, Rupert Ormond & Simon Pierce (2016) Population structure, abundance and movement of whale sharks in the Arabian Gulf and the Gulf of Oman, PLoS ONE 11(6): e0158593. Fernando Cagua, Jesse Cochran, Chris Rohner, Clare Prebble, Tane Sinclair-Taylor, Simon Pierce & Michael Berumen (2015) Acoustic telemetry reveals cryptic residency of whale sharks, Biology Letters doi:10.1098/rsbl.2015.0092. Fabrice Jaine, Chris Rohner, Scarla Weeks, Lydie Couturier, Mike Bennett, Kathy Townsend & Anthonny Richardson (2014) Movement and habiat use of reef manta rays off eastern Australia offshore excursions, deep diving and eddy affinity, Marine Ecology Progress Series, 510: 73-86. Peter Haskell, Andrew McGowan, Anna Westling, Adriana Mendex-Jimenez, Chris Rohner, Kym Collins, Marcela Rosero-Caicedo, Jodi Salmond, Ara Monadjem, Andrea Marshall & Simon Pierce (2014) Monitoring the effects of tourism on whale shark Rhincodon typus behaviour in Mozambique, Oryx x doi:10.1017/S0030605313001257. Lydie Couturier, Chris Rohner, Anthony Richardson, Andrea Marshall, Fabrice Jaine, Mike Bennett, Kathy Townsend, Scarla Weeks & Peter Nichols (2013) Stable isotope and signature fatty acid analyses suggest reef manta rays feed on demersal zooplankton, PLoS ONE 8(10): e77152. Lydie Couturier, Chris Rohner, Anthony Richardson, Simon Pierce, Andrea Marshall, Fabrice Jaine, Kathy Townsend, Mike Bennett, Scarla Weeks & Peter Nichols (2013) Unusually high levels of n-6 polyunsaturated fatty acids in whale sharks and reef manta rays, Lipids doi 10.1007/s11745-013-3829-8.